Members of the Living History Society at Pioneers and Soldiers Memorial Cemetery Lake Street gate demonstrate toys as they used to be–when “Legos” (and pretty much all other toys) were made of wood. 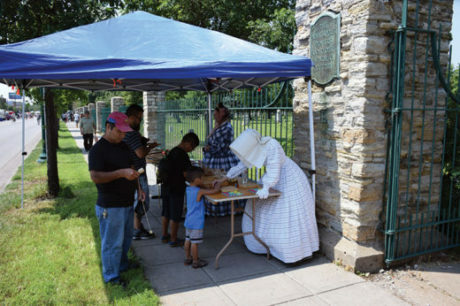 Kids marvel at hoop skirts and bonnets. 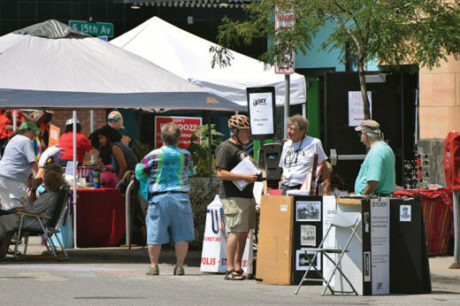 The Alley Newspaper “Did You Know” History Exhibit and survey table while left to right Dave Logsdon of Veterans for Peace talks with Harvey Winje and Lee Leichentritt conducting surveys and inquiring passersby about familiarity with The Alley. Folks who completed a survey were entered into a drawing for a $10. Gift Certificate at Welna Hardware. 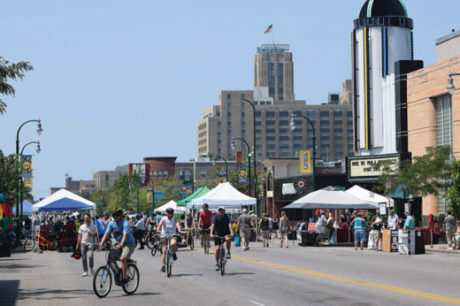 OPEN STREETS MPLS 2018 on E. Lake Street Sunday July 22nd extended from Elliot Avenue West of the Midtown Global Market (the tower in the distance) seven blocks east to the Avalon Theatre—home of In the Heart of the Beast Theatre—where, outside its doors, was a performance bandstand, HOBT info presenters (inside art, too), information tables by Midtown Phillips Improvement Association information, East Phillips Improvement Association and Amalgamated Transit Union Local 1005. 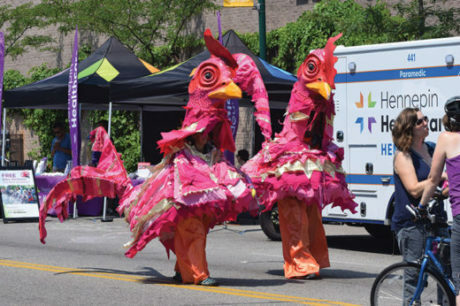 The Alley Newspaper was adjacent with its “Did You Know” History Exhibit and sought completion of Reader Surveys to inform The Alley’s Transition Team. Previous Topic: Drone launched to survey the bridge!